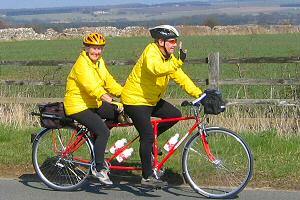 The 2004 Easter rally was based at Stow on the Wold Youth Hostel on 8th to 12th April. The Hostel is in the fine old market square, between the White Hart Inn and the Old Stocks Hotel. Together with most buildings in the square, it is listed as being of architectural interest and dates back to the 16th century. Recently refurbished, the hostel provides a comfortable and central base from which to explore the Cotswolds. There are many picturesque villages linked by quiet lanes within easy distance. The hostel can accomodate up to 48 people in 8 bedrooms (mostly en-suite). There are six family bunk rooms. In addition to the catering on offer from the hostel, it has well equipped self-catering kitchen. A large dining room overlooks the town square and it also has a comfortable lounge with a TV. There is a small car park at the rear. The club booked sole occupancy for the weekend. For those not wanting to stay in the hostel, numerous nearby B places and camping facilities were utilized. Amongst the many places to visit in the area are Bourton on the Water with its model village and railway. 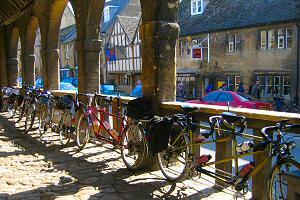 Other villages include Burford, Moreton-in-Marsh and Chipping Camden. The area has numerous tea shops and pubs. Good Friday was a glorious sunny and warm day and it was wonderful cycling in the countryside up and down all those Cotswold hills and coming across friends on tandems who hadn't been seen since last year. The route had been arranged with three loops going off the short route, thus enabling people to add to the 28 mile route without too much advance commitment. Attractive Chipping Camden was fairly full of tandemists stopping for refreshment, with a good display of tandems being parked in the old Market Hall in the centre of the main street. Broadway Tower was another good gathering point for chinwags and a short walk to the base of the tower to look at the view. Cotswold Farm Park was very busy for tea before returning back to Stow. Saturday was a mizzly, dull day but we warmed up in a friendly café in Bourton-on-the-Water and enjoyed a lovely ride along the Windrush Valley to lunch at Burford and then back along the other side of the Windrush River, through Bourton-on-the-Water and back to Stow. After supper the AGM was held in the Youth Hostel at Stow. Sunday's weather was better than Saturday's, with sun and cloud. An early coffee stop at Moreton-in-Marsh with lots more chat before going up a seemingly never ending hill to reach Wyatt's Garden Centre at which there was no room in their tea rooms as they were fully booked for roast lunches. Their pasties from the deli counter were very tasty though and were eaten in the sunshine outside whilst others went on towards Chipping Norton looking for sustenance. The Rollright Stones were fairly popular, with people walking inside the circle of stones with divining rods in their hands. A nice undulating country route took us back to Stow. Monday was more sunny than cloudy. The hills felt very hard today but we cycled through fabulous countryside with lovely views to reach Northleach for refreshment and a look at the several brasses in the church. On to Aldsworth and up the steep approach road to the church where we admired the many horrible gargoyles adorning the front of the church. Up and up again before swooping down to Bourton (heaving with people) and back to Stow. This was a very enjoyable Easter weekend with beautiful countryside, quiet lanes, interesting architecture, good company, good routes and we appreciated Ian & Mary Lambert arranging it all for us to enjoy.